Receive a 10% discount on the purchase of 6 bottles, or 15% off a case of 12 bottles (can be mixed - in order to make sure the correct discounts apply on a mixed case, please fill out the Order Form and I'll send you an invoice with correct shipping and discounts applied). 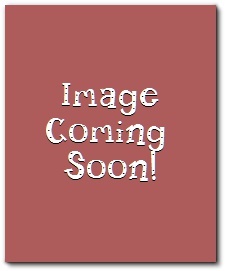 You can also request your own custom labels so you can give them as gifts for special occasions. Email me for information. 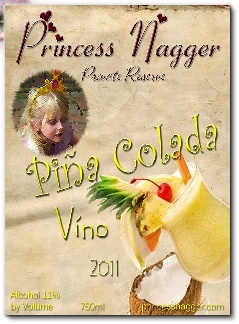 Princess Nagger Wines are made in our quaint winery kitchen from carefully hand selected produce. 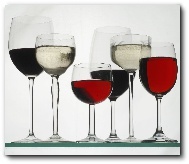 Our goal is to produce a high-quality, old-fashioned tasting wine. Our winemaker puts great care and effort into crafting interesting and pleasant wines from old family recipes and new innovative ideas. Can't decide what to buy that special someone for a gift? Send them a Princess Nagger Gift Certificate! 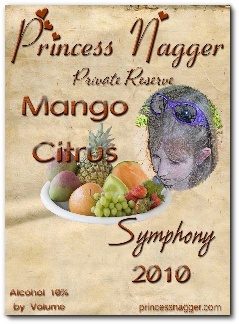 Princess Nagger Mango Citrus Symphony is a delicious blend of ripe mango flavors and crisp citrus notes combined with the grapefruit, peach, banana, and papaya aromas of Symphony. Goes well with spicy foods or sliced mangos. 750ml - 10% Alcohol By Volume. 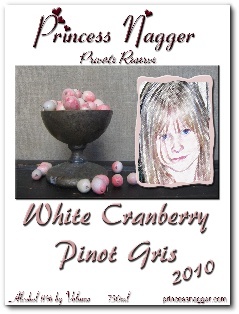 Princess Nagger White Cranberry Pinot Gris bursts with the sweetness that has made White Cranberry a unique and popular flavor in juice, and now you can enjoy that flavor in this refreshing variety. This wine is very easy to drink and is perfect for backyard barbeques and sharing with friends. 750ml - 11% Alcohol By Volume. Feel free to send me an email to let me know what your preference is on the wines waiting in the wings to be made - I'll prioritize those for you. Also, you can email me to have me set aside specific bottles for future purchase so you don't miss out on the ones you really want before you're ready to buy (and before they are sold out). 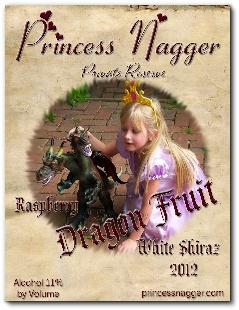 A Silver Medal Winner in the 2012 International Winemaker's Competition, Princess Nagger's Raspberry Dragon Fruit White Shiraz is a blush style wine that has been given some fire of excitement with the addition of sweet dragon fruit, then gently splashed with tangy cool raspberries. Ignite the grill and sear some spicy shrimp skewers, or prepare some Thai green curry cuisine for a night of fire and flare! Serve well chilled or on ice. Princess Nagger Piña Colada Víno is an offbeat approach to a traditional, tropical favorite. Pearly white color, luscious coconut aroma and a clean hint of pineapple will have you instantly relaxing and daydreaming of paradise. Serve well chilled or over crushed ice. 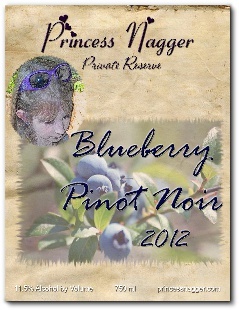 A delightful blend of blueberries and Pinot Noir, this latest addition of Princess Nagger Blueberry Pinot Noir is sure to please everyone's taste. The tangy, sweet burst of blueberry combines with the light-medium body and cherry-spice flavors of the Pinot Noir to bring a delicious blueberry fruit flavor to your palate. 750ml - 11.5% Alcohol By Volume. Princess Nagger's Chocolate Orange Port is an intensely flavored dessert wine that is full-bodied and rich, with complex aromas of bittersweet dark chocolate, thick with ripe orange and marmalade flavors. Excellent sipped in a comfortable chair by the fire, it is also brilliant with nuts and cheese, or drizzled over vanilla ice cream for a completely decadent after-dinner treat. Save it for a special occasion - this Chocolate Orange Port will age gracefully for several years, evolving and showing complex layers of flavor over time.